The Uniblock design - foot and flange execution in one case! Uniblock design for foot and flange mounting. Gear case machined on all sides for universal application. Revolutionary new gearing geometry here and in all the other models results in exceptional running smoothness. 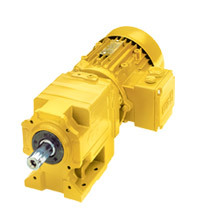 For special environmental conditions the gear unit can be fitted with two shaft seals. Unbelievable price on Helical geared motors in Shah Alam (Malaysia) company Watt Euro-Drive (Malaysia), Sdn. Bhd..